to turn your M camera into a SLR! or - adapt the Viso lenses to your Leica M240 or favorite Nikon or Canon DSLR! 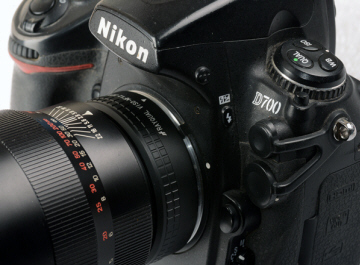 why not use your Visoflex lenses on a modern multi-featured digital camera? 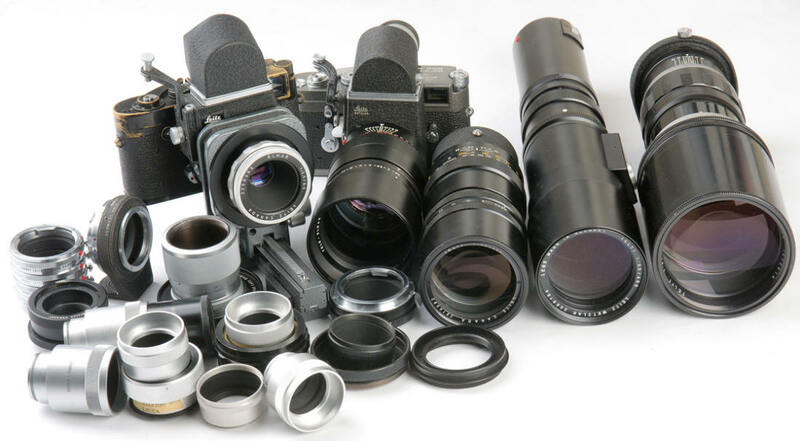 The Leitz Visoflex system is the largest and most comprehensive reflex housing system ever made for any 35mm Rangefinder camera. In various guises, it was available from the middle 30's to the 80's for both screw mount and M mount cameras. 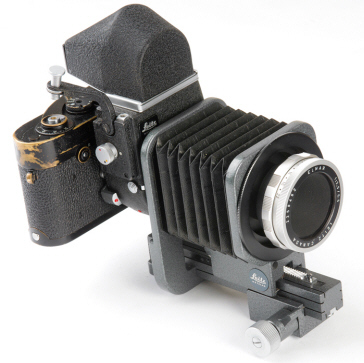 The Visoflex (aka Viso) is a mirror housing and ground glass focusing system that converts the svelte Leica Rangefinder camera into a rather large and clumsy--but versatile, single lens reflex. To be fair about though, some people really like the Visoflex system. I frankly haven't figured them out yet. Non-standardization: Almost every lens requires a special helical or adapter for that PARTICULAR lens and VISO combination. Availability: Since the VISO system is discontinued, it's often difficult to find the proper part. Cost: When you do find them, typically it requires $150 or more of adapters and helicals to hook up your short mount or lens head to your VISO. Yes, some helicals can be used with several lenses. But it just so happens that the combination I am most interested in (the 65 Elmar, the 90/2 Summicron, and the 135 Tele-Elmar) ALL require different HELICALS and ADAPTERS! The lack of modern features. Modern is not the word. 90 Lens heads from the 90/4 Elmar, 90/2.8 Elmarit, 90/2 Summicron. Note that these are the older versions of the Elmarit and Summicron, not the current versions which do not have detachable lens heads. NOTE that the lens heads of the older 90 and 135 lenses simply unscrew from their rangefinder coupled focusing barrels to attach to the appropriate Viso accessory, generally a Visoflex focusing helical which is sometimes combined with an intermediate connecting adapter. Visoflex capabilities expanded with Bellows and slide copier via the large and heavy Leica Bellows 1, and the small and heavy Leica Bellows 2. They worked as a normal bellows, or allowed the short mount lenses to be mounted directly with special adapter rings. This would allow from infinity to close-up focusing. 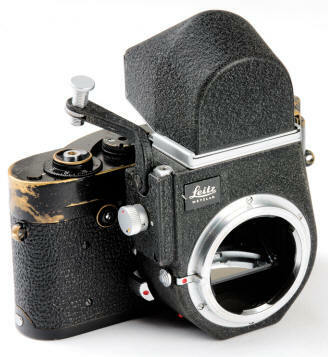 If you want to have a confusing photo day, go through an old Leica catalog showing the Visoflex system. Take a look at the myriad assortment of gizmo's and do-dads they Goldfarbed together over the years to get all of the parts to work together. Imagine Rolls Royce quality designed by Picasso, you get the idea. YET, the basic idea of bridging the gap between RF and SLR in one outfit remains alluring. 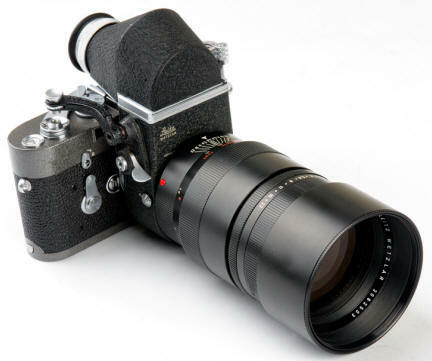 Instead of using the Visoflex housing to convert the film M into a backward SLR, why not use Viso lens heads on a modern multi-featured digital camera? 5) Make your own series of adapter rings, mating the Viso glass to the SLR of your choice, in whatever manner you choose. There are too many options to explore all of them here. A lot depends upon which SLR system you want to combine your M with. That decision alone will make a lot of your decisions for you. WHICH LENSES do you want to use on both systems? My own choice were the 90/2 Summicron and the 135/4 Tele Elmarit. WHICH SYSTEMS do you want to combine with Visoflex? My own choice is the Leica M240, Nikon AND Canon DSLRs. WHICH BODIES do you want to use? My own choice is the Leica M240, Sony NEX series, Fuji X series, Nikon AND Canon DSLRs and the Canon T90. Option 1 turned out to be simple for me. It works like a charm. 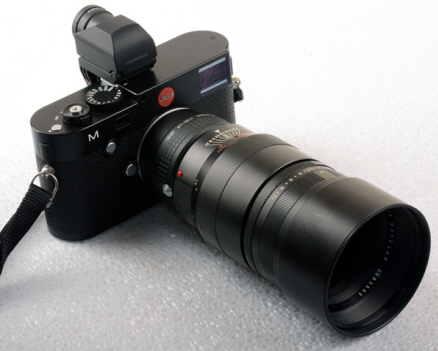 The live view of the Leica M240 brings new easy closeup options to the digital Leica M. Put the Viso glass together with the required adapter and helical designed for the Visoflex, except instead of the Viso, use the custom adapter to put in on the N90s. Add the Canon N adapter described in Adapters, and it all fits on the Canon T90 instead! damn, I wish I could always be this brilliant. Option 3 seemed the simplest solution, but turned out a failure for my camera combinations. The Leica Bellows 2 has a unique design with a lower rear protruding rail. Unfortunately, the protrusion makes the minimum bellows extension beyond the 90 mm infinity position with my preferred N90/T90. It would work, however, with smaller less featured bodies like the A1 or FE-2 which could fit closer to the rear bellows mount without an larger extension tube. The N90/T90 combination could work on the Leica Bellows 1, but I just don't like it's much larger size. Option 4 took some doing, but I figured it out. The problem is that the large lens head diameter of the 90/2 Summicron is too large for many small compact bellows. 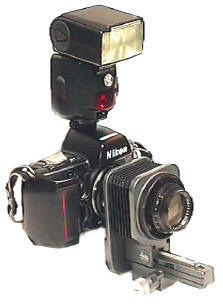 They will, however, mount on the Nikon Bellows III quite nicely. OF course, the problem them becomes how to mount the lens heads. It's quite simple for the 135/4 Tele-Elmar. It's lens head is standard 39mm diameter. Nikon made a standard adapter to Leica screw mount 39mm thread! Screw the lens head on the adapter, and it just pops on the front of the bellows! The 90/2 adapter was more complicated. I epoxied a Nikon K2 adapter inside the bellows adapter ring for the 90/2 lens head. It works great. Note that the shortest lens usable on this setup is the 90, not the 65. So to this point, I have either the 90/2 or 135/4 lens heads on adapters which bayonet on the front of the Nikon Bellows III. This is where it gets tricky. The Bellows III will NOT fit the N90S! The body grip prevents the bellows from mounting. HOWEVER, if I add the Canon N adapter to the end of the bellows, it will all mount easily on the T90!! Option 5 is doable, but I wanted to keep things simple as possible. Variable extension tubes will be very useful if you choose this route. 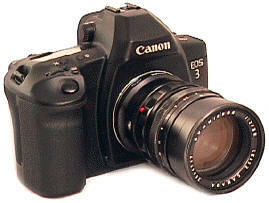 Topcon and Canon (FD) made them, but there are probably others as well. On top of that, with the various Canon to other mount adapters, you can also combine parts of the Nikon/Pentax/Exakta/Topcon/Canon systems to get the desired results. The limit is your own imagination. Now I can use either my Canon or Nikon DSLR with my 90/2 or 135/4 M lenses. WHY???? Revised: March 30, 2016. Copyright � 1998-2015 Stephen Gandy. All rights reserved. This means you may NOT copy and re-use the text or the pictures in ANY other internet or printed publication of ANY kind. Information in this document is subject to change without notice. Other products and companies referred to herein are trademarks or registered trademarks of their respective companies or mark holders.